so, i told you i was a trousers convert. here i am in the 'cerise' version of my mustard trousers. they fit me just as amazing as my other pair, but i have to say i'm not sold on the colour. i ordered them online and hoped they'd be more of a red colour.. but they're actually pretty bright fuschia pink (or 'cerise' as topshop call it... they're actually quite a bit brighter in person than these photos). sadly, i'm not a bright pink girl so these babies are being sent back. spotted this striped top too, and considering stripes are my second favourite pattern right now (do stripes count as a pattern? ), i bought it. will wear it with everything. this is so beautiful. amazing combination. every one of your looks is faultless. I wrote about you on my blog today (well, it's scheduled and going up tomorrow!!). I got some mustard jeans after being inspired by your topshop trousers!! They look cute in this colour but I bet bright pink is tricky to pull off!! I love your blog- you are a constant inspiration to me. Bright pink is such a perfect color on you! I think you should keep them...they're a lovely shade of pink. But I guess if you're not 100% comfortable in them then you're probably better off spending the money on something you'll love. Maybe they have them in a third shade that might float your boat :) As for the stripes...perfection! Your trousers are gorgeous! <3 I love the colour and shape, and they go oh-so perfectly with your bowler hat! The trousers do look amazing on you! Ahhh, you've made me want to return the loafers I bought recently and get some patent ones instead. I do love patent! Guhhh I'm kind of in love with this! And the trousers look really wonderful. these are such an interesting colour, but it is annoying when they aren't the colour you had in your head. 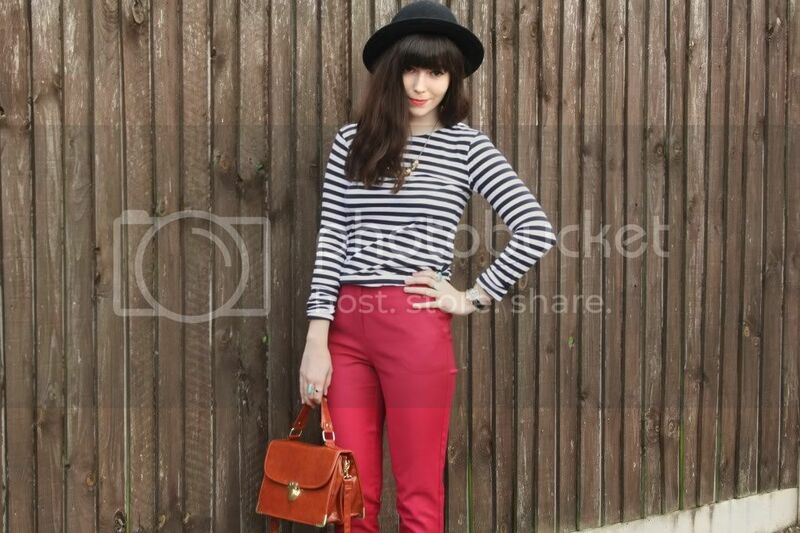 ahhh love the red trousers! This is such a chic look. Loving the coloured trousers. 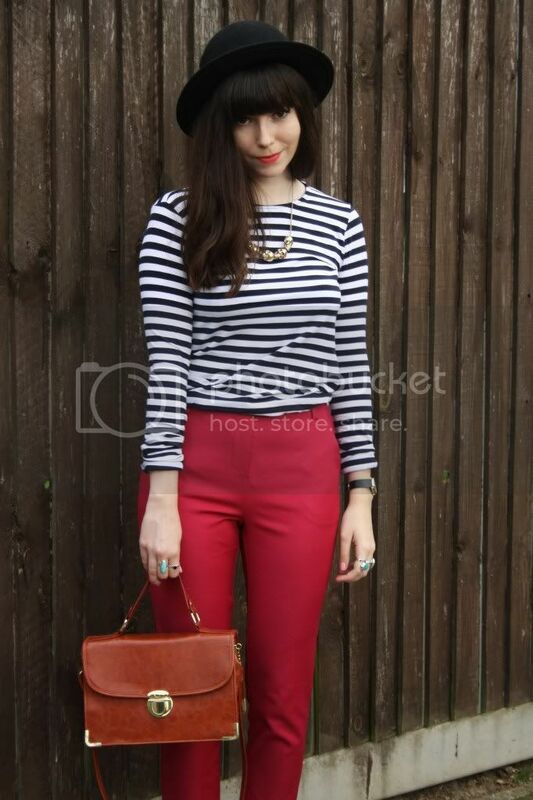 Love the breton and the red pants, lovely! What a lovely colour, it looks good on you! I'm a bit squeamish about wearing pink myself, I feel like I'm already too old for it, bah. I love the bag, very vintage style! 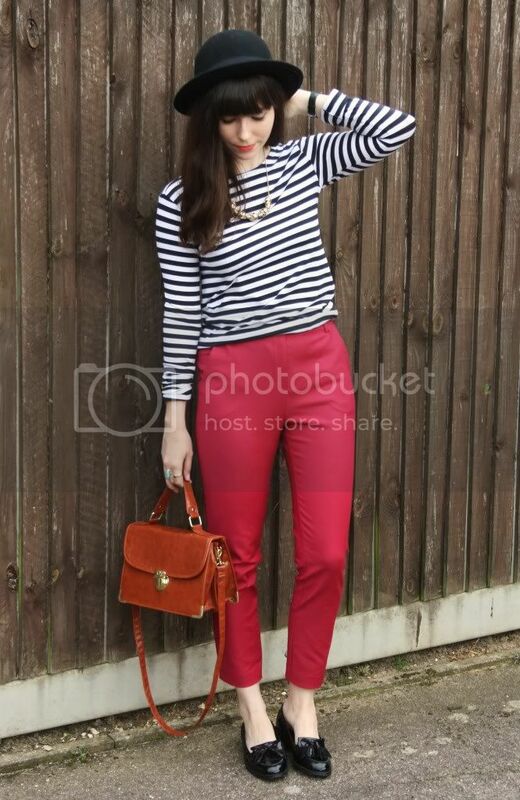 The striped top and colorful pants are so awesome together! I really love how perfectly those pants fit too. Wonderful outfit! Love the striped top. Good to know the pants are more pink then red. Im not a pink girl. lovely lovely lovely. i love your cute little smile!